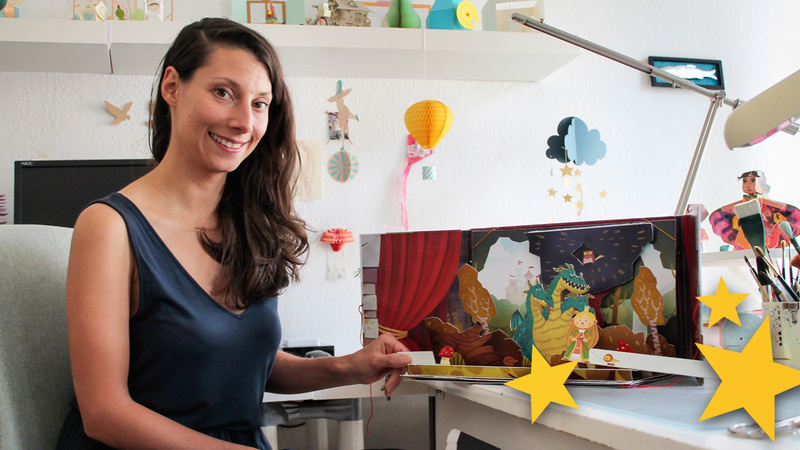 Tina Kraus from Germany is a freelance Illustrator and Paper Engineer who creates the most wonderful pop-up books, paper toys, pop-up cards, displays and packaging for promotional products. 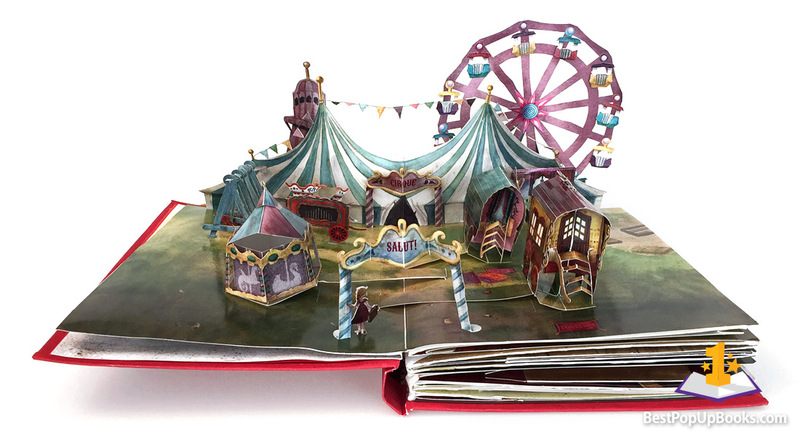 Tina is also the creator of the beautiful Circus Zingaro: A Pop-Up Book. We already did a review about Circus Zingaro last week and we now had the opportunity to ask Tina some questions about this book, a new project and her work as a Paper Engineer. BPUP – Why did you choose the circus as a subject for this book? TK – I don’t really remember, but I’ve always liked the mood of these mysterious carnivals from the past. I also liked the the Idea of a sweet little girl meeting all these odd characters and that she will find a new family with them. BPUB – Can you summarize what the public response was to Circus Zingaro in the past seven years? TK – The video has been watched more hat 100.000 times and I regularly get emails where people ask me how they could buy the book. I was in contact with a French and a German publisher who were interested in publishing the book, but after many considerations and even after I made some simplifications compared to the first version of the book, it turned out to be too expensive for them. Due to the many different and sometimes difficult techniques they would need to print more than 10.000 books (?) for the first edition to make it affordable, and the French and German market is too small for that. I would need a big international publisher to make it happen. BPUB – All movables and pop-up techniques fit very well with the type of circus acts you have chosen. Was it a challenge to choose which technique to use for which act? BPUB – Can you tell us how the process of designing and engineering of Circus Zingaro is done? TK – I start with a rough scribble and then I make a first simple model just to try out whether my Idea would even work. When it does, I start to draw a vector template in Adobe Illustrator. I then print it and cut it out or use a silhouette cutting machine to do that and refine the model more and more, adding details with every step. Sometimes I make more than 10 or 15 dummies of one mechanism until it all works. For a complex page like the first one where you can see the whole circus, I need to figure out how the wagons can be pulled up even when they are not centered on the page. I work on each mechanism individually first before I combine them to such a spread. If I get stuck, I go through the books of the great masters like Reinhart or Carter and look for inspiration. When I’m satisfied with the blank paper models, I print the templates very lightly on watercolor paper and start illustrating. Then I go back and adjust the templates to the scanned illustrations. Finally I do a test with the finished templates before I start nesting the printing sheets. Then printing and cutting of the final book can begin. A cutting machine or knowing someone with a laser machine helps a lot at this point! BPUB – Have you ever considered making a crowdfunding project from Circus Zingaro? TK – Yes, and some people have suggested it to me too. However it seems to me that it would be a full-time job or even more work than I alone could handle if I would do that since I don’t have any experience in dealing with a printing company that specializes in pop-up books or handeling the logistics of such a project. So right now I’m still hoping for a conventional publisher who already has the know-how to realize such a project. BPUB – Is this the final version of the book? TK – Yes, kind of. But if a publisher would decide to go ahead with the project, I might need to do some more adaptations to make sure it can be mass produced or to reduce the cost. BPUB – In addition to pop-ups, you also design pop-up cards, paper toys, displays and packaging. How did your interest for working with paper started? BPUB – You and Florian Biege also created a wonderful pop-up theatre (play) book titled “Rittergeschichten – Ein Pop-Up Theater“. Can you tell us more about it? TK – It was a spontaneous idea we had last year. The concept of the stage was perfect because I wanted to make a pop-up book that would be easier to mass manufacture. We are hoping this will make it easier to find a publisher. The machanisms now are pretty simple, but still add a nice effect to the book. The final book is planned to contain 6 stages, 8 characters, 4 plays and a lot of possibilities for your own stories. We could also imagine it would work as a series with more settings like a pirate ship etc. 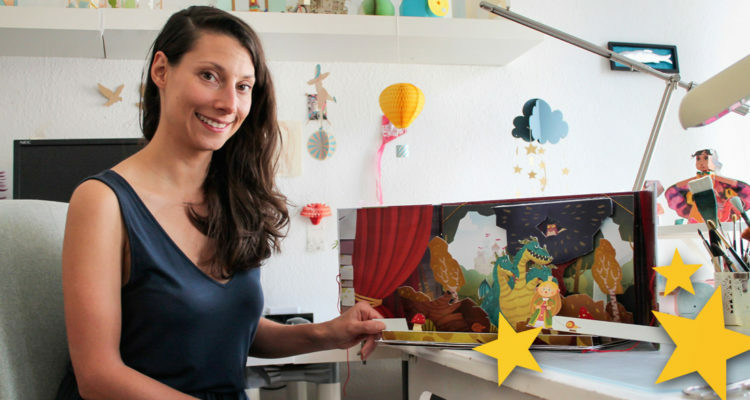 BPUB – Are you all caught up now and can we expect more pop-up books in the future? TK – I would love to do more pop-ups and hope I will get the opportunity! BPUB – As a Paper Engineer, do you also have other Paper Engineers who inspire you? TK – Yes, of course. Where can I start? Probably anyone of whom I have a pop-up book in my bookshelf has inpired me somehow! As I mentioned I started with a book by Paul Jackson. Then David A. Carter with his Elements of Pop-Up. It is so helpful! Robert Sabuda and Matthew Reinhart probably inspired me most to test out what is possible to make pop up. BPUB – Do you also collect pop-up books? TK – I have for a time, so now I have a small collection. But since there is no space left in my bookshelves, I stopped and only buy books that I feel are really special for some reason. But I still get more books as presents sometimes! BPUB – Thank you Tina for this interview and the opportunity to review your work!